In Addis Ababa, Ethiopia, United Nations Secretary-General António Guterres and Moussa Faki, Chairperson of the African Union Commission, sign a Framework Agreement between the two organizations. A stronger partnership between the United Nations and the African Union is “not a choice but a necessity” in tackling today’s complex peace and security challenges in Africa, a senior UN official said on Wednesday. “The complex peace and security challenges we face in Africa are such that neither the United Nations nor the African Union can address the challenges on their own”, Sahle-Work Zewde, the UN Special Representative to the AU and Head of the UN Office there (UNOAU), told the UN Security Council. “As the Secretary-General noted during his briefing to the AU Peace and Security Council in Addis Ababa last week, the African Union is the most important strategic partner between the United Nations and a regional organization in peace and security, development and human rights,” she added. The two organization have prioritized the development of a systematic, predictable and strategic partnership, based on mutual respect, shared values and comparative advantage, Ms. Zewde noted. The UN and AU signed the Joint Framework for Enhanced Partnership in Peace and Security in April last year, and the Joint Framework for Implementation of Africa’s Agenda 2063 and the 2030 Agenda for Sustainable Development in January 2018. The partnership has since been “characterized by closer collaboration, more regular exchange of information and consultations, and coordinated action including joint field visits and joint statements”, she said. Ms. Zewde was briefing the UN Security Council on the Secretary-General’s report on strengthening the partnership between the two organizations on issues of peace and security in Africa, including the work of her Office. A key point of the report is that the UN and the AU recognize their inter-dependence. They also need to recognize the critical role of sub-regional organizations, which are often the first to detect early warning signs of impending conflict, and are important partners in promoting dialogue and reconciliation. She stressed however, that even though the UN-AU relationship is stronger than ever, they need to work even more closely. She also underscored the importance of conflict resolution by reacting quickly and decisively to head off conflict before it escalates, while ensuring African ownership of this process. In the report, the Secretary-General has expressed his support for the financing of AU-led peace support operations authorized by the Security Council, including through UN assessed contributions. It is also essential that the issue of predictable and sustainable financing for AU peace operations authorized by the Security Council is - on a case-by-case basis - framed within the context of a mutually-agreed political strategy, and informed by joint analysis, she added. 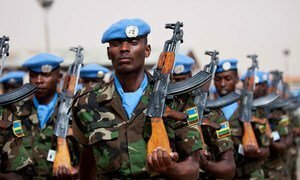 The Security Council on Friday extended the mandate of the joint United Nations-African Union peacekeeping operation in Sudan’s Darfur until the end of June next year, but reduced the number of troops deployed in the field with an eye towards the mission’s eventual exit.